(Bloomberg) -- With Brexit in disarray, it’s hard to imagine that European Union leaders will have more pressing matters on their minds when they meet Thursday in Brussels. And yet their summit’s agenda includes a dinner on relations with Beijing, as well as a discussion on slow-moving trade talks with President Donald Trump’s administration. 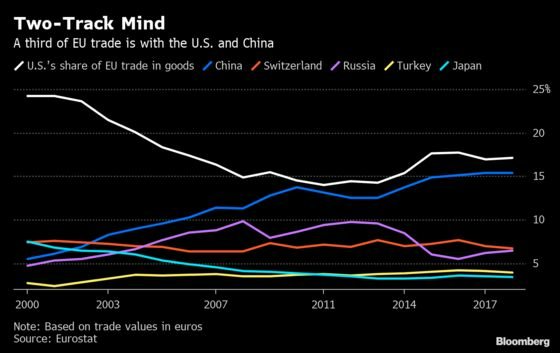 Eurostat data show that the U.S. and China are the EU’s biggest trading partners, meaning that any disruption in commerce, such as by Trump’s threat to impose tariffs on car imports, could have major consequences for the bloc.